In my last post on this blog I wrote about the difficulties of finding a suitable language for an Elvish culture and the pitfalls of copyright infringement. There was some good comments on a Facebook group I belong about the pros and cons of that and also in the comments section of the blog post as well. So I thought some readers might be interested in how I have approached constructing fantasy languages or conlangs in the past. 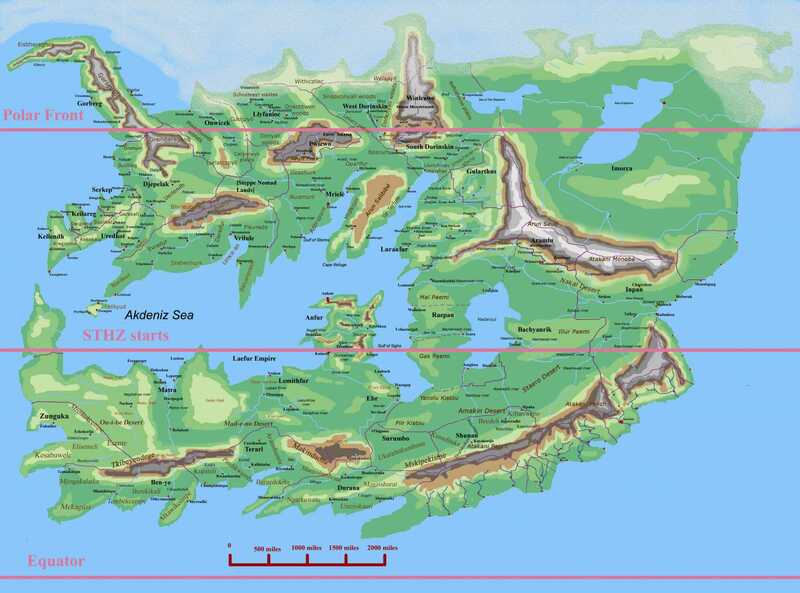 The largest bit of world-building is to create a world called Ladmas and a continent called Neriador. This has gone through a few incarnations and in one form or another has provided the setting for my novel The Return of the Free, and also the short stories, Two Lives for the Sea God, Demon River and Forged in Blood. Here’s a map of the latest version of the world – the place names have been created using the languages I created. I’ll just give details of one of the main languages for now and maybe post about some of the others in the future. The dominant culture of the continent is the Lurar. Source of true Lurar language hotly disputed – each nation exhibits a variation on the language – spelling and pronunciation, but most cosmopolitan natives can understand other foreigners – backwoods would have more impenetrable accents though. Language is fairly flexible and allows for complexity of meaning and subtleties – as benefits a language well used for trade, diplomacy, politics, thought and bureaucracy. However, also fairly static as developed early – resistance in some quarters to innovations. Some nations more open to outside influence – so Nukush has the tribal influence of the desert for instance. Ironically the most pure form of Lurar is found in the 100 princes where due to the excessive degree of legalism, diplomatic treaty writing and cultural exchange the language has remained stable – also the common exile of different political parties to other countries has meant that this form of the language has often been exported. Freedom of thought – philosophy, poetry and drama has also been popular in the 100 princes so culturally the rest of the Lurar-speaking countries tend to follow their lead. Although I could have delved much deeper into creating a language, I think the process of creating a vocabulary that seems consistent gives the language a uniqueness and also something that seems like it could be real. So if you want to include Elves in a work of Fantasy fiction that should be pretty simple right? I mean everyone knows how Elves speak – what kind of names they have etc – Elrond, Legolas, Galadriel – they all sound suitably, well, Elvish. That’s the position I was in recently when contemplating writing a fantasy work including Elves, Dwarfs etc – the standard fantasy tropes – but with a twist of course. So wanting to be fairly thorough about my world building I decided I would need a naming system for people and places – a constructed language effectively. And therefore following on from that I naturally thought I should take a look at Quenya – the main Elvish language created by Tolkien – surely I could just use that as a basis and make up some cool and realistic sounding Elvish names. But having read part of an online Quenya course (which is very good by the way and fascinating in itself), I realised that it wasn’t so simple. The author of the course includes a lengthy section on copyright, the main aim of which is to defend the right of people to publish courses such as his and also their own works in Quenya – not for profit even seems to be a bit controversial. The author of the course made the point that any commercial fictional work that used Quenya to create a naming system and language would effectively be in breach of Tolkien’s copyright. That stopped me in my tracks – I hadn’t even considered that. So I looked into it a bit more – did other fantasy works with Elves really have their own unique languages. The main works are actually games – D&D and Warhammer – they both have their own languages – Elven and Eltharin respectively – although I suspect both are fairly superficial in nature. I looked a bit further and found that fictional works also had their own languages – for instance the Elvish language of Gael Baudino‘s Strands series is based on the Romance languages, and the Elvish languages of Andrzej Sapkowski‘s The Witcher saga, are apparently based on Welsh, Irish, French and English. So it seems other authors and creators of Elvish cultures have also endeavoured to steer clear of using Quenya – a shame in a way as Tolkien created such a rich language – no one could do something more comprehensive I suspect for a race that doesn’t exist, but also you could also say it would be great to write fiction in Tolkien’s world, which also would be derivative and remain in the sphere of fan fiction. So where does that leave my Elvish setting? Looking at creating a new language I suppose – and probably digging out a Conglang book such as the Language Construction Kit. However, I’m still planning on learning more about Quenya for the inspiration and also to make anything I create myself a bit richer.